You want me to plan what at the library?!?! There’s a family of little ghosts who should only eat things that are white. When the first ghost eats strawberries, FLIP her over, red-side facing the audience. Continue with the rest of the ghosts. But when Mama Ghost goes out to run errands, the hungry little ghosts eat strawberries, broccoli, blueberries, grapes, and drink some lemonade. The last little ghost eats a whole tub of chocolate chip ice cream (because it’s mostly white…obviously.) When Mama Ghost gets home, she finds that all of her little ghosts are colorful! 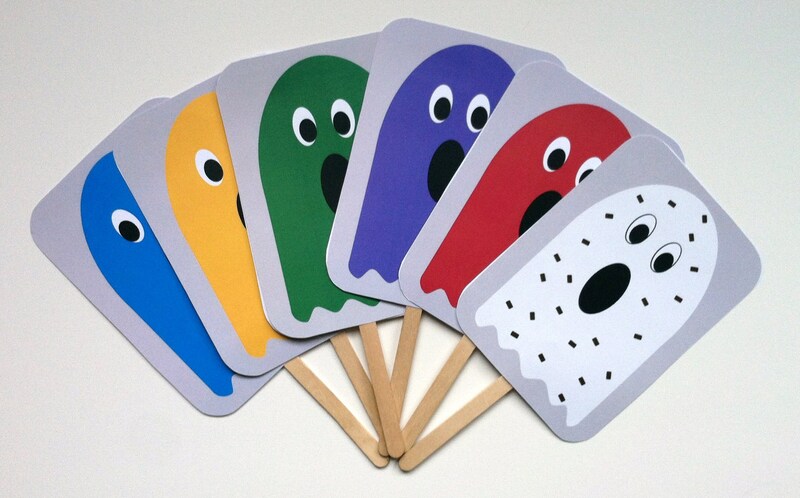 Participation: Ask your audience what color each ghost will turn as they eat the different foods. You’ll get confusion and then giggles when the last ghost turns chocolate-chip-colored! FLIP them all back over, white-side facing audience at the end. Mama Ghost gives each one a nice, tall glass of milk and sends them off to bed to rest…. and sure enough, the next morning they were all ready to say “Boo!” on Halloween. The views expressed on this site are my own and do not reflect those of my employer or its patrons. The content here belongs to Kidjamboree, unless otherwise expressed.